Maher Farhan of Garden Gourmet Market. WEST TOWN — Owners of a mom-and-pop grocery store that opened in West Town just blocks from a huge CVS drugstore are pushing for equal treatment after their corporate neighbor got an exemption from an area ban on new liquor licenses while they were left high and dry. Garden Gourmet and CVS opened at about the same time near the end of last year, and are located within two blocks of each other on North Ashland Avenue. But while CVS quickly got a liquor license, Garden Gourmet has still been unable to get one. Maher Farhan, who owns Garden Gourmet, hoped to offer wine and craft beers to customers, but he's had to refer that business elsewhere. “I tell [my customers] there’s a lot of places on Division, a spot on Milwaukee, and CVS. Nine times out of 10 they go to CVS,” Farhan said. CVS, located in a historic bank building at Ashland and Division, was treated much differently than the mom-and-pop grocery when it came to getting a liquor license. While most of East Village has a prohibition on new liquor licenses, an exception was made to allow CVS to sell liquor and packaged goods. When Farhan went to Alderman Joe Moreno (1st) to request the restrictions be lifted for his business, he said Moreno told him that he’d "just lifted [the restrictions] for CVS" and that Farhan needed to go to the East Village Association to draft a plan. The plan was introduced at an October meeting attended by community groups and Ald. Moreno. The pros and cons of lifting longstanding bans on liquor licenses on a two-block stretch of Ashland Avenue, south of Division to Augusta, were debated. The proposed exemption would include a ban on sales of any high-alcohol beer such as King Cobra or Colt 45, and a restriction that no more than 30 percent of sales would come from liquor. Liquor sales would end at 11 p.m.
Farhan said he would be more than happy to comply with those limits. "We are not that kind of place. We just want to be able to sell wine and craft beers, not King Cobras," he said, adding that Garden Gourmet primarily sells fruit and fresh produce, as well as dry goods. 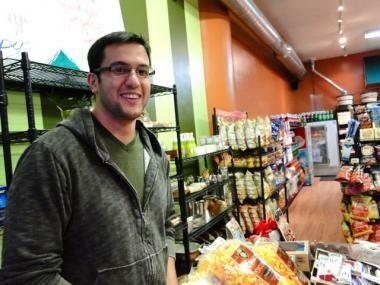 Farhan likened his business to other local markets such as “Green Grocer, Olivia’s, W Crossings, Goddess and the Grocer — they all have [a liquor license]." Josh Rutherford, owner of Smoke Daddy, was at the meeting and believes both sides have an argument. Rutherford said, "The East Village is a little overprotective and rightly so; it’s their backyard. But in order to continue to promote and grow for businesses to come in, you have to give a liquor license at some point. The neighborhood has developed to a point that I don't know people are going to seek that place out to buy liquor and sit on a park bench." While the business community and the West Town Chamber have for some time supported lifting the ban, members of EVA launched an online petition with nearly 170 names to keep the current restrictions in place. “They tell me they are not worried about me. It's 'the next guy,'" Farhan said. Neal McKnight, president of the East Village Association, told DNAinfo.com Chicago that he believes urban planning is all about forecasting possible ramifications of a decision, particularly one as important as this one. In a conversation with Chicago Pipeline's Jon Graef, Ald. Moreno said he hasn’t decided whether to lift the liquor ban (for Ashland Avenue, south to Augusta) but said making a decision would ruffle feathers either way. According to McKnight, the final decision of whether or not to lift the restrictions does not rest with the alderman. "The final decision ultimately rests with the State Liquor Commission in Springfield and that commission has limited criteria to review and often overrules the denials of liquor licenses at the local level," McKnight said.